Sometime during the early 1980s, a number of people in many different places suddenly understood that they could afford to become publishers, as photocopy shops began to appear in cities around the world. Certainly it had been possible before this time for private citizens to self-publish, but the compromises were many: One accepted either high cost or poor print quality (or any number of other trade-offs) -- and even that only after surmounting the intervening technical barriers, acquiring or hiring the necessary equipment and skills to realize the difficult task of putting print to paper. Accessible photocopying changed all that. Admittedly, the print quality of photocopies, particularly for continuous-tone photographs, is not as good as professional offset printing, but it was generally better than any other inexpensive alternative at the time. Photocopy can also be more forgiving of the technical flaws common in works made by artists still developing a set of skills; a quality which, interestingly for us, lends itself to an attitude of experimentation. Unlike offset, which generally requires a minimum print run too large for most small publishers to afford, photocopy editions can be made in any quantity, at a low unit cost. One can thus do an edition of, say, three, or ten, or fifty, just to give away to friends -- or to bulk-mail to hundreds of devoted readers. Photocopy is not fine printing, but it is good enough for many purposes; and it had an important effect: With photocopy, casual publishing suddenly becomes possible. It was in this context that we began publishing PhotoStatic Magazine in 1983. We began the project unaware that there already existed a cultural movement of small magazines, or “zines,” many of which relied on cheap photocopying for their very existence. It seemed the right time. Punk rock had left in its wake many like us, who had taken its “do-it-yourself” attitude to heart, placing it front-and-center in our artistic repertory. With a certain disdain for mass culture (or one could say it was a love-hate relationship), it was as if we set out to make our own cultural world, furnishing it according to our fancy. PhotoStatic was fortunate to find itself within this blossoming subculture, comprising literally thousands of projects and titles, and flourished there for the next decade. The zine movement evidently grew out of small press traditions that had their roots in activities as various as political pamphleteering, the self-published and idiosyncratic works of artists such as William Blake, sci-fi and fantasy fanzine publishing (beginning decades earlier), samizdat (from the Russian for “self-published”), Dada reviews like Le cœur à barbe or Merz; as well as the stereotypical (though not uniquely) American spirit of independence and self-reliance. Like Dada and Surrealism, and even the geekier sci-fi and fantasy crowd, the zine movement was a rejection of conformity and an attempt to put the imagination in the driver’s seat. The “unslick” esthetic of xerox echoed, and sometimes made direct use of, the qualities of the methods detournement championed by Situationism, and often seemed perfectly suited for the aspirations of an anti-slick subculture that felt itself “soaking in” an enveloping sur-culture pathologically fixated on its own glossy surface without regard to its often mediocre and unappealing substance. The fact that we were based in the US midwest and, like many zine producers, outside of the cultural centers on either coast (and in which we could only participate vicariously) a certain amount of cultural self-reliance was necessary and desirable. The charge was often leveled in the zine community that the fact of being free to express oneself was valued over the content expressed. It is certainly true that zine publishers were often enthusiastic, energetic, and prolific, and these self-expressive and self-publishing exercises were often profound life-transforming activities for those involved, which led to predictable excesses along the way. This was certainly true for us. PhotoStatic’s purview was established early on as “xerox art,” as we called it, flouting Xerox Corporation’s trademark by taking its name as generic. We were interested in the xerox machine’s dual nature: It was, after all, a camera that made an image of anything placed on the platen glass; and it was a press, delivering an edition at the touch of a few buttons. We wanted to explore the particular formal qualities of xerography; its expressionistic contrasts, its electric granularity, its charcoal-sketch visual timbres, its ability to fragment and unite disparate images using collage techniques, as well as the performance aspects of interacting in real time with the sweeping scan light of the machine, producing unique prints each time the start button was pushed. We set out, in part, to develop an esthetic for xerox art, and eventually attempted a casual body of criticism. We also positioned PhotoStatic to collect xerographic work by others and to help catalyze a community, a gathering-place in print, of photocopy artists. In the same spirit, and with the same interests in mind, the PhonoStatic audio cassette series was begun a year after PhotoStatic's first issue; and the VideoStatic compilation a few years later. It was not just xerox that interested us; we wanted to generalize the PhotoStatic set of practices and apply them to all accessible media. There were numerous strands in the zine community, and PhotoStatic became a meeting point for many: There were the xerox collagists, the visual poets, the correspondence artists, the punk designers, the rubber stamp artists, the home tapers, the Neoists, the Barbara Kruger acolytes, the queerzine publishers, the upside-down ‘A’ anarchists, and the anti-authoritarians; as well as certain art historians and academics. The more conceptually-based “generative” artists did not show up in PhotoStatic in the same numbers as the socially observant and critical strands of the counterculture did. And there was the occasional oddball from rural Wisconsin or Wales that just liked to make xerox collages. There was generally a feeling of greater connectedness with, and a taste for, popular forms of culture, and a marked ambivalence among many contributors to so-called high and academic art forms. As the 80s wore on, PhotoStatic’s circulation grew (peaking at around 750) and its base of contributors became extensive, with mail arriving at our Iowa City address from five continents and both sides of the Iron Curtain. 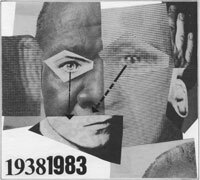 In the late 80s, after a lengthy (and characteristically playful) transition period, the bimonthly PhotoStatic transformed itself gradually into Retrofuturism, during which time the project reached its apex, coinciding with the run-up to our participation in the Art Strike 1990-1993. In January, 1990 and for the next three years, the PhotoStatic title ceased to appear, replaced by the “anonymous” title YAWN: Sporadic Critique of Culture; as well as the title Retrofuturism, ostensibly edited by the Tape-beatles. The Art Strike, whose main agitator was apparently the English author and artist Stewart Home, was at least partly aimed at demoralizing the art world and those who unthinkingly valued its shameless hunt for the next contrived scandal around which to push art among the cognoscenti and to those buying it as an investment or to bask in its perceived prestige. In a largely symbolic gesture, PhotoStatic returned after the Art Strike for a single issue, no. 41, in January, 1993, never again to appear; though a trickle of issues under the titles Retrofuturism, YAWN, and the CVS Bulletin (the official organ of the Copyright Violation Squad) followed. By mid-year, the project had entered an indefinite hiatus, as we turned our attention to other interests. In the period 1996–98, having returned to Iowa after a year living abroad, we tried to resurrect the project, and it appeared re-christened as Psrf, letters chosen to reflect two previous titles, and taking up the continuous page-numbering system of the previous output. By this time, however, the Internet boom was well underway, and much of the do-it-yourself and small publishing activity had moved onto the worldwide web. This should not be surprising, since the web offered many of the same strengths and virtues of cheap and immediate photocopying -- not incidentally combined with nearly effortless access to a potentially unlimited global audience, as well as the total elimination of printing and postage costs. Signs of this transition were apparent early on. In the late 80s, many zine editors had bought personal computers and laser printers solely for the purpose of typesetting their text. As we used these machines, we quickly became aware of additional, sometimes intoxicating, possibilities that the personal computer opened up. Gradually, sophisticated page layout and illustration software became one of the many possible ways to produce a zine. Some even made exploratory forays into this new field by producing content to be distributed solely on floppy disk; others delved into the possibilities of software for creating graphics that could be made in no other way. Still others became programmers, producing databases, games, and other interactive works. With the advent of widespread computer networking throughout the 90s, yet another universe of possibilities was opened up for creative exploration. In retrospect, it seems clear that the zine movement would split into two strands: those who wanted to cling to the old and ossify The Zine as a canonical form and praxis; and those who valued the social and esthetic context of zines over whatever form they may have taken (which was, after all, often merely expedient). This latter group were more than willing to take this energy with them into the realm of electronic media. It can certainly be argued that there is strong resonance between the zines of yore and the blogs and personal web sites of today, from their independent creation, to their fixations on vanishingly narrow interests, and in the similarity in informality of tone and personability they each exhibit. People undoubtedly have not stopped making art using photocopiers, but the historical period immediately preceding the internet boom of the mid-90s saw an alignment of technologies that favored works on paper; whereas afterward, the electronic media have increasingly garnered much of this attention, energy, and creativity, in large- and small-scale production alike. Due to these and other factors, our reanimated project was no longer able to find traction, and in 1998 the final issue, Psrf 49, appeared. It was the only issue of our entire output that appeared in full color. It was printed on a PostScript laser printer, a technology that is essentially an evolved photocopy machine: one which uses digital code instead of a physical image and a laser as a light source, rather than a lamp and a lens. In 2002, we inaugurated the PhotoStatic Magazine Retrograde Archive on the worldwide web, archiving each of the many print and cassette issues in electronic form, free for the taking.